Marché Président Wilson welcomes visitors with an abundance of flowers on display at the entrance. While it is lovely to exit the metro and find blossoming hydrangeas and renoncules, I was not in the market for anything floral, but rather inspired by the suggestion of Phyllis that I go see légume superstar Joel Thiébault's stand. Before purusing Thiébaults renowned variety of vegetables, which his family has been selling at Marché Président Wilson since 1873, I took a leisurely tour of the entire market. Besides a selection of local/organic producteurs, one thing I love to find at markets are stands representing different regions or neighboring countries. Marché Président Wilson has quite a choice of regional products and themed stands; from Italian goods to Moroccan products, as well as some specialties that hit a little closer to home, such as a traditional Brittany-style Crêperie and a "bar à patates" (potato bar) specializing in spuds from central France. Artisinal bakers, poissonneries, butchers, and cheese vendors line the expansive alley of avenue du Président Wilson in the 16th arrondisement on the day of the market. 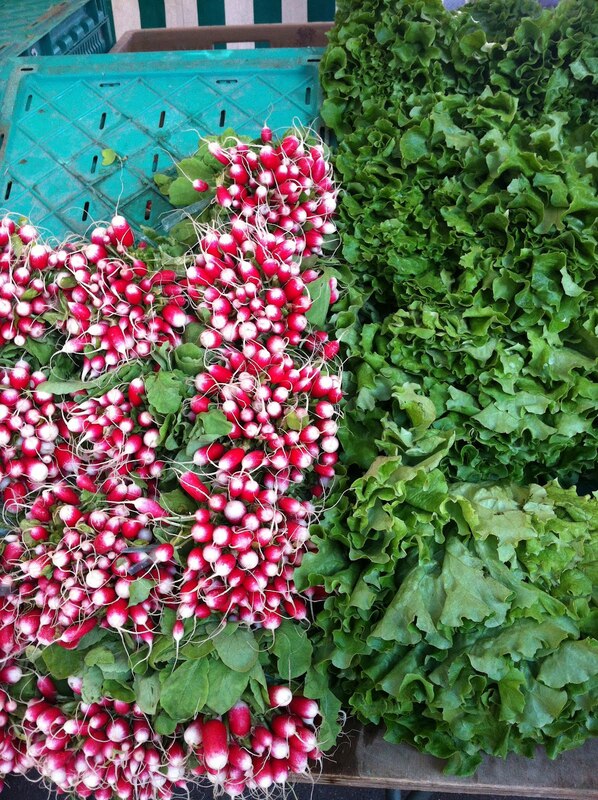 There are also a plethora of vegetable vendors, many of which stock French-grown and seasonal products. I fear that these pauvres maraîchers may be overshadowed by their celebrity neighbor, whose stand is the only one that constantly has a line. And what a line it is, consisting of a gamut of shoppers; from scholarly followers of the art of heritage and hard-to-find veggies, to 16th arrondissement snobs who couldn't possibly buy their ruffage anywhere but Chez Thiébault, to anyone who falls in between. It is quite a fun, and colorful, experience to shop at Thiébault's stand. When I was there the produce still ressembled a Winter's crop but, living up to his expectations, Thiébault had managed to find all kind of colors to include amongst his carrots and radish stock. 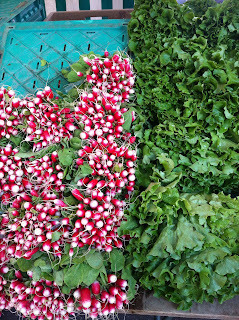 The late Winter/early Spring line included "red meat" and "green meat" radishes as well as peppery black radish. The carrots were brilliant shades of purple, yellow, and orange. I grabbed a mix of "Purple Haze", "Yellow Stone", and " La Chantenay" varieties to take home for a carrot salad for dinner. Many of Thiébault's vegetables attribute their origins abroad, the Japanese Roquette "Mizuna" or the "Rose de Chine" radish, for example, but all the products are grown in France by Thiébault himself, only a few kilometers from Paris. The thrill of picking up produce you've never seen in your life adds a boost to your shopping experience and the bursts of color emanating from this producteur's stand are enhanced under the Springtime sun- making a visit to Marché Président Wilson worth a metro ride. 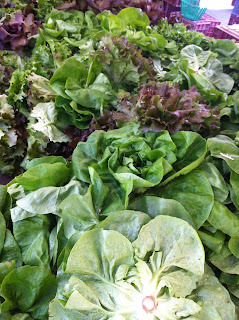 If you can't make it to the market, you can order paniers of Joel Thiébault's produce at Le Haut du Panier. Otherwise, you can find Thiébault at Marché Président Wilson on Wednesday and Saturday or at Marché Gros-la-Fontaine Tuesdays and Fridays.